and re-printed in the Austin 7 Owners Club magazine with many thanks. The Austin-Seven car is, perhaps, the most widely used of any car in its class; moreover, it has followed its original design very closely all the way through. This little car has a wheel base and track of 6 feet 3 inches and 3 feet 4 inches respectively; the road clearance is 8¾ inches and the turning cir­cle 33 feet. The engine fitted is a high-efficiency four-cylinder water-cooled one of 56 mm. bore and 76 mm. stroke, giving a cylinder capacity of 745 c.c.. The engine is rated at 7.8 h.p. but it generates 10.5 h.p. at 2,400 r.p.m. and correspondingly higher horse-powers at higher speeds. Racing mod­els of these engines have attained speeds of 6,000 to 7,000 r.p.m. The engine has side-by-side valves, aluminium pistons of the three-ring type (the lower being a scraper ring), a two-bearing crankshaft carri ed on roller bearings and detachable cylinder head. Lubrication of the engine is by a submerged gear-driven oil pump which forces oil to the crankshaft bearings; other parts receive their oil supply from the oily mist created in the crankcase. 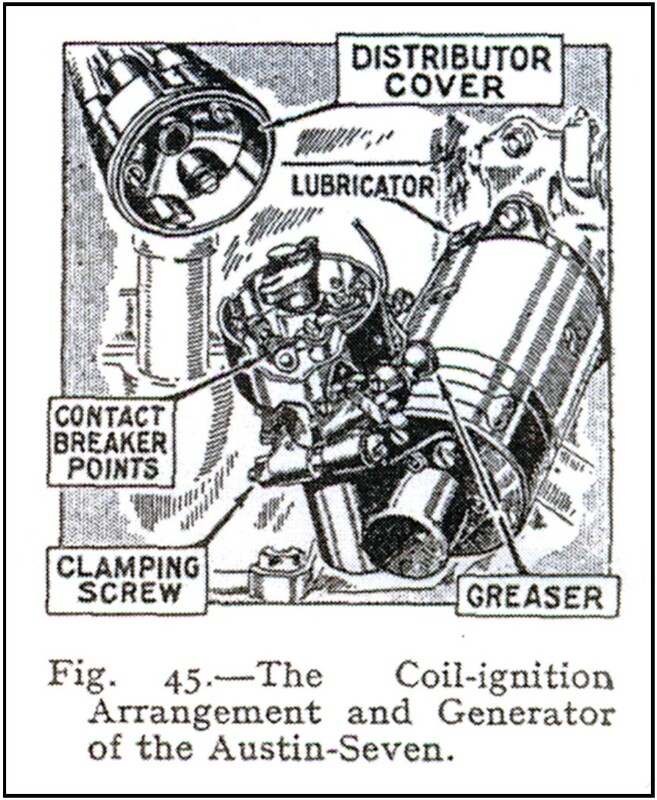 Ignition is by Lucas battery and coil, the distributor unit being driven through the dynamo. The power is transmitted from the engine through a single-plate clutch to a three-speed gear box, giving the following road ratios: first speed 16 to 1; second speed 9 to 1; third (top) speed 4.9 to 1; reverse is 21 to 1. The gear lever is mounted centrally in a position convenient to the driver. From the gear box the drive is through a short intermediate propeller shaft having a bearing fixed to the frame c ross member at its rear end, thence the drive is through a second shaft to the helical bevel final drive. The rear axle is of the three-quarter floating type with differential and torque tube. Four-wheel brakes are fitted, the brakes being applied to all four wheels either by foot or by the hand brake lever. The adjustments for the brakes are placed in accessible positions. Steering is by worm and worm wheel, there being provision for taking up the wear. 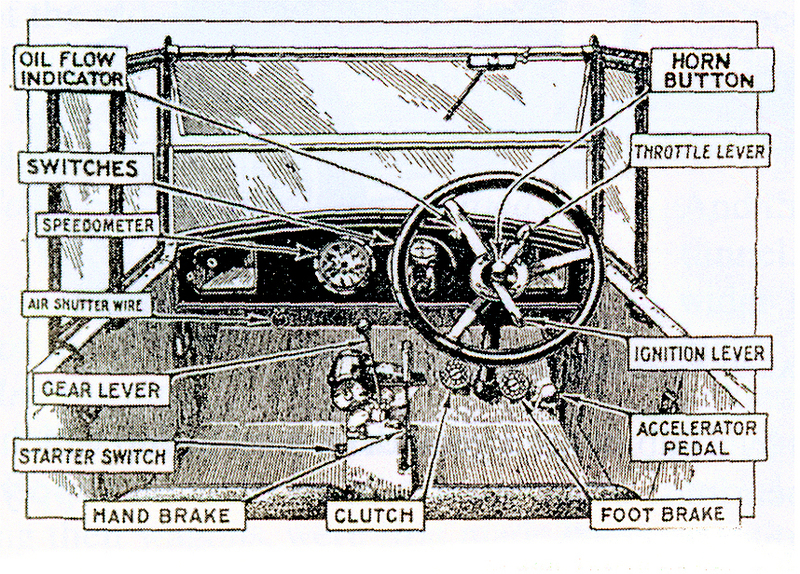 Over the steering wheel are the gas and ignition control levers, and horn switch. The springing system consists of a transve rse or semi-elliptic cross spring at the front, with a forked radius rod to locate the front axle; at the rear quarter-elliptics are fitted. Shock absorbers are fitted both fore and aft. 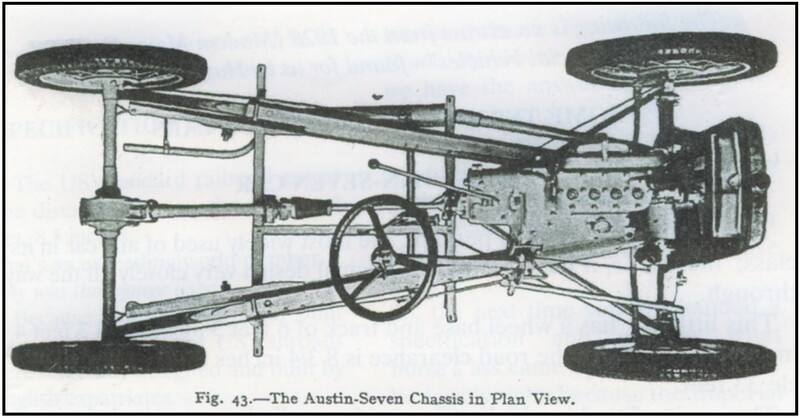 The chassis frame, as we have previously mentioned, is of the simplest design ending at the anchorings of the rear springs. Three-stud attachment wheels are fitted, the tyres being 26 x 3.50 inches. This car has a maximum speed of about 50 m.p.h., with a cruising speed of 35/40 m.p.h. On good dry roads the petrol consumption is about 40/50 m.p.g.